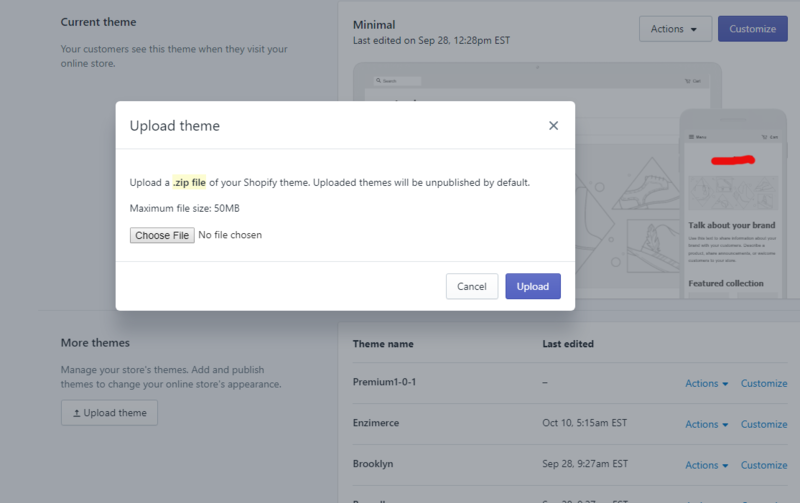 Congratulations, you've just signed up for Shopify and one of the first tasks you'll be presented with is to pick a design theme for your store. After spending hours if not days and weeks choosing your theme and setting it up then nobody buys from you! What Can you do? It's easy, you can buy a high converting shopify theme like the Shopify Booster Theme. 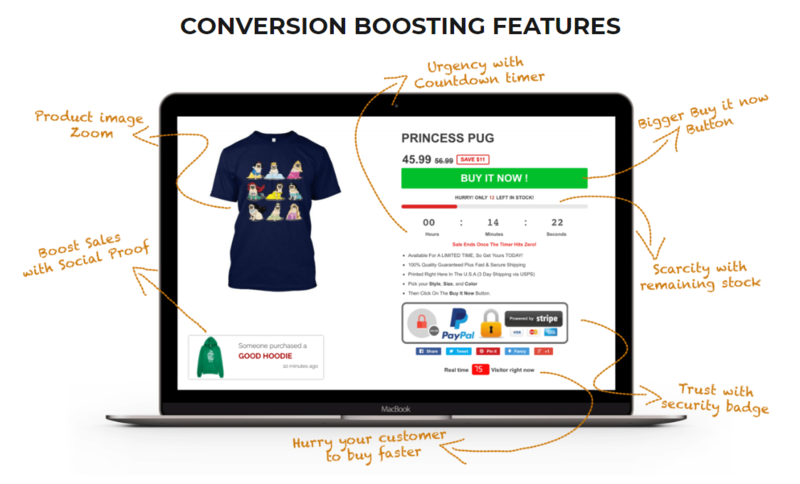 In this Shopify Booster Review I'm also going to review the Booster Premium theme too and discuss why conversion optimization is vital to your success. What Is Shopify Booster Theme? What Is Shopify Booster Premium? How To Install The Booster Theme. How To Customize The Booster Theme. So what is the Shopify Booster theme? The Shopify Booster Theme is a layout and style pack for your shopify store. Shopify offers a number of their own free style themes to make your store look stunning. In addition there are numerous paid themes in the shopify store. The paid themes may or may not have extra features over and above what is provided in the standard free themes. But why Booster what is different? Apart from making your store look great, the booster theme has been designed as a high converting theme. But what do you mean by high converting? I hear you say. Well let's say you have a standard free or paid theme on your store and you send 100 visitors, how many sales do you expect to make from the 100 visitors? According to invespcro.com the average conversion rate across all industries is around 3% and some high converting stores it can be as high as 22%. So for an average store with the 100 visitors you're going to make around 3 sales. Wouldn't it make sense to ensure your site converts as high as it possibly can? In the case above, what if you could boost your conversion rate from the average 3% to just 6% then your sales have instantly doubled and you're earning 100% more. Now doesn't that sound good? The thing is, 6% is being conservative! Imagine if you could get 10% or higher! How would your sales look then with an increase of 200% in cash sales? The Booster theme has been optimized to take advantage of human psychology and to encourage visitors to buy and ultimately increase your conversion ratio and sales. This theme is packed with features, too many to list in this review so we will concentrate on the main features which make this theme different from the rest. 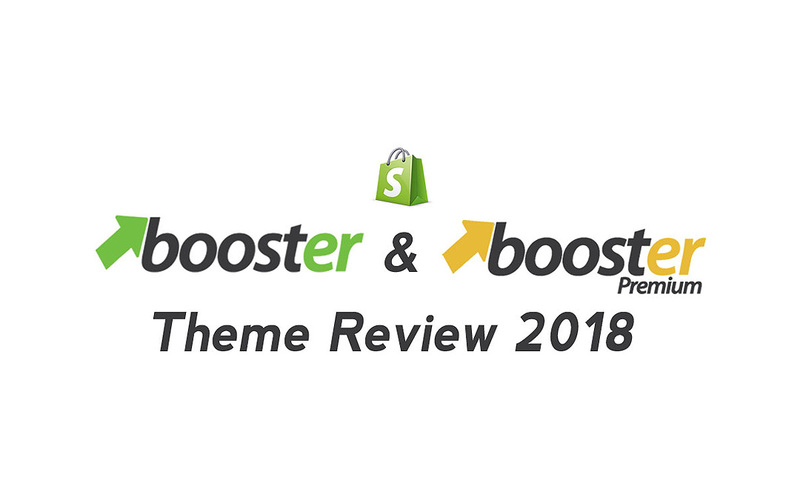 The Booster Premium theme comes with all the above features plus the addition of 20 extra layout features. The Benefits Of The Booster Theme and Booster Premium Theme? Yes both themes are packed with features but how does this benefit me. There are a number of benefits to using this theme over the standard themes. The Number one benefit is increased conversions and sales. Save money, no more paid apps are needed. Complete control over the layout and design. No need for a developer or designer to build the store saving time and money. Mobile Optimized checkout designed to convert more sales. One time payment, no recurring monthly fees. Each of the features talked about earlier can be added to a standard store by way of adding Shopify Apps to extend the functionality of a standard store. Each of these apps incur monthly fees shown below. By using the Booster or Booster premium theme you eliminate the need for all the paid extras. What you'd save on apps would pay for the theme within 2 months! 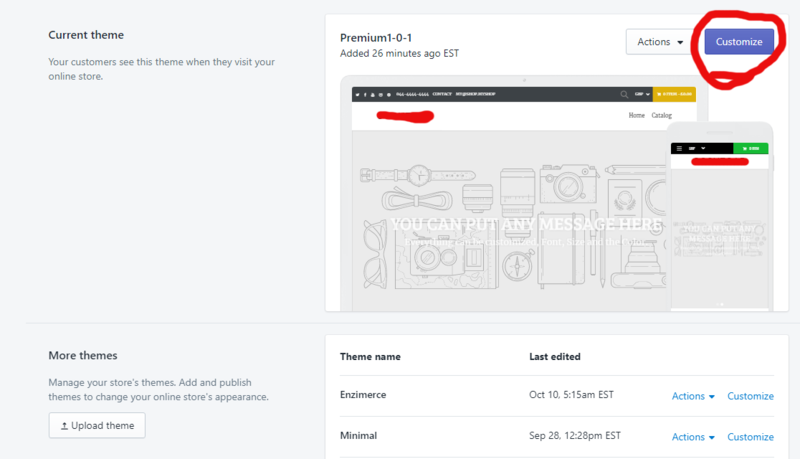 All the extra features in the Shopify Booster and Booster Premium can be purchased and added to your store individually and here's what it would cost you! This makes a total spend of $78.63 per month just on apps alone to create the same functions as the booster theme. This saving could go into your marketing budget! Downloading the theme is really easy to do. Once you've purchased the Booster theme, the next step is to download the theme to your computer before uploading it to your store. 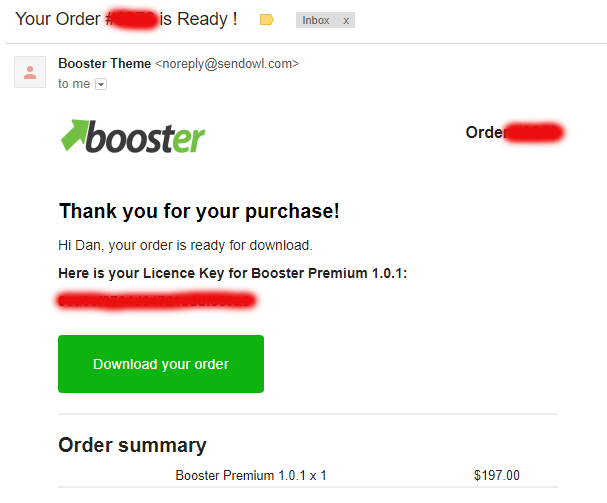 First check your email for the booster theme receipt. In the receipt email there is a button directing you to the download page. Click the button link in the receipt email and then you are taken to the download page. Now click the download link and save the zip file to your desktop or some other location you have specified. How to upload and install the Booster theme. Login to your store admin and on the left menu click "Online store"
Select the theme from your computer and click "upload"
Once the theme has been uploaded, you will see it listed on the right with your standard theme. 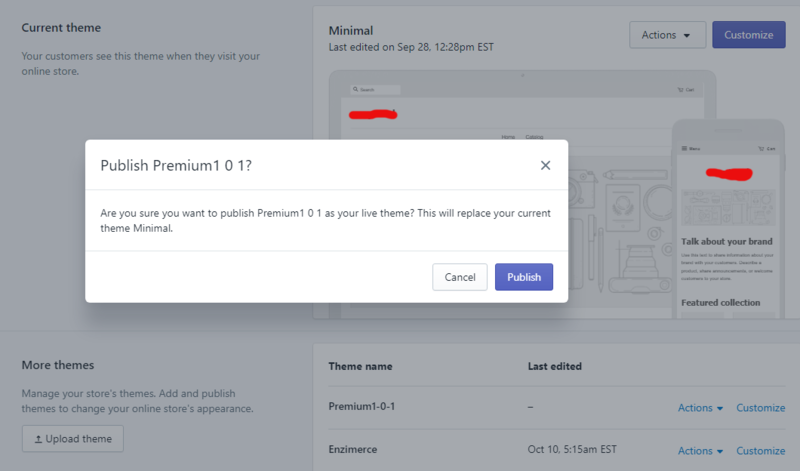 Select the Premium Booster theme and choose publish to activate the theme on your store. The last step is to copy your licence key from your receipt email and paste it into the theme when you start to customize it. Customising the theme is relatively straightforward. It's a process of click, set and save with the occasional image uploads. Watch the video below on how to customise Booster! The booster theme comes in two flavours. The difference between them is the Booster Premium has the 20 extra front end layout sections for creating an endless array of different front end layouts. The standard Booster theme only has a few customizable front end sections so you are somewhat limited with the layout customization. having said that the standard theme is still a great looking theme with all the same conversion maximising features. You can get a small 10% discount on the price of the Premium Booster Theme with the following code. Simply copy the code below and paste into the checkout when you buy. This will reduce the price to $177.30 saving a further $19.70. The 10% Discount Code Below is for the Premium version. The discount is NOT available on the Standard Booster Theme. The beauty of both these themes is the one off payment. No more monthly recurring app fees pushing your costs up, especially for beginners where cash may be tight. The monthly savings can be put into your marketing budget to make your saving earn you even more. Plus there's 12 months support included in the licence, so should you have any problems there's nothing to worry about. The Booster support is there to help. In addition to this they have a frequently updated FAQ page with recent support questions which would be helpful to all theme owners. You can also contact them direct on their helpdesk, so help is never far away. Both themes are easy to use and customise. They combine all the high converting apps into one single package, enabling you to earn more for less. Simply one of the best themes I've ever used and highly recommended.